Tadcaster Albion bowed out of the Integro League Cup on Tuesday evening when they were beaten 2-1 by North Yorkshire rivals Scarborough Athletic. 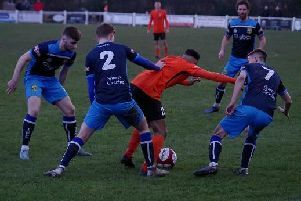 Having already seen off Premier Division Frickley Athletic and high-flying Shaw Lane from Division One South in previous rounds, the Brewers will have fancied their chances of sealing a quarter-final berth. Yet, in a game played in horrendous conditions at Boro’s Queensgate base, they lost out to a controversial late goal. The home side made the better start in the torrential rain, and they had already rattled the woodwork through Craig Nelthorpe when they moved in front after just six minutes. Nelthorpe curled a dangerous ball into the box and big striker Benny Igiehon headed past Chandler Hallwood in the Albion goal. Hallwood then had to be at his best to keep a Nelthorpe strike from 30 yards out of the top corner of his net, before Rob Youhill’s cross glanced the crossbar at the other end as Taddy threatened to hit back. Boro’s Billy Logan could have made it to 2-0 shortly before the break but skewed wide of the mark, and there were no more goals before half-time. The second period saw the Brewers hit their stride and they began to put their hosts under real pressure. Only a fine block from Matt Lucid denied Josh Greening an equaliser as he cut inside his man and unleashed a strike that looked destined for the back of the net. Liam Shepherd then hit a shot narrowly over the bar before Boro threatened again and Hallwood denied Logan with an impressive one-handed stop. As Billy Miller’s side began to press harder for a leveller, the game began to open up and Tom Corner was denied twice in quick succession by home gloveman Jordan Porter. The visitors’ pressure was eventually to pay off, however, and they got back on terms in the 77th minute when Corner’s flick-on was delicately guided over Porter by the left foot of Josh Greening. Parity was to last just five minutes though as Boro reclaimed the lead in controversial fashion when Lucid smashed home following a scramble in the box. There appeared to have been a handball by a home player in the build up to the goal, but it was missed by the match officials, and Albion’s cup run came to an end.